Best Hawl in a while, and a personal first. After at least 6 weeks of no new restocks... I finally found some new stuff. Sorry for the quick, poorly setup photo. Hiding it around the corner form the toy section, in the layaway counter area perhaps helped avoid some of the scalping. If there had been scalpers, I wouldn’t have found my first Super Treasure Hunt car... and not one, but TWO of them... the Toyota Off-Road Truck STH with real-riders. I never find STH cars, and even as I near the 900 mark in my personal collection, these are the first I have found, let alone purchased. With two Retro Entertainment vehicles, I kept the mainlines to 10, but I could have gotten more of any of these, except the STH truck, and the Charger Police MBX cruiser, which was by itself. There were two other 180SX Nissans (2nd down, 2nd from left) and MBX R1200GS bikes (and some yellow K1300R bikes, not pictured as I already have that one), and three other blue on white Escorts... another RE Corvette, and two more Top Gun Ninjas. They also had several which I didn’t pick up, the ‘56 Chevy convertibles from the Brady Bunch, and a couple of Checker Cabs from the TV show Taxi, and 1 RE Dark Knight Camouflaged Tumbler tank. 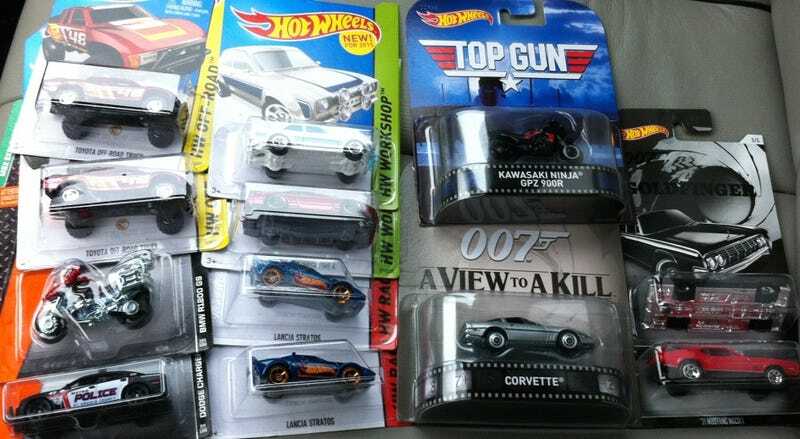 There were at least 50+ of each of the James Bond re-carded mainline series. I wish the Porsche series had been that prevalent around here. If anybody BADLY needs those on a HWEP trade, and has some stuff ready to trade, let me know this afternoon, and I may be able to go back on my way home, otherwise it may be monday before I can get back, and they may be more picked-over by then. Some of these may be likely arriving in your area, too. I will entertain HWEP offers for the 2nd STH Toyota Off-Road Truck. I will consider something interesting and Real-Riders-grade. (Retro Entertainment, Garage, Real Riders, or other premium or rare-to-find castings) Let me know if you have something. My interests are quite wide in scope. A STH 69 Boss 302 in Spectraflame orange, or an older Retro Entertainment 007 DB5 (real rider wire wheels) would both be quite welcomed, but I will consider others, too, but otherwise I’ll DLM one, and keep the other on-card and hold on to it for a while.